Crewest proudly announces “Blow Up L.A.: The Art of Blowing Up Your City” an exhibition opening on February 4, 2012 and curated by Gonzo247 of Aerosol Warfare. Blow Up L.A.! is part of the traveling Blow Up (Your City!) Aerosol Warfare exhibition which features customized Jamungo BUD & NADE vinyl dolls by national and local artists as well as other artwork. Artists with backgrounds in graffiti, street art, design, illustration and other urban expressions will customize the urban vinyl toys with no given limitations. 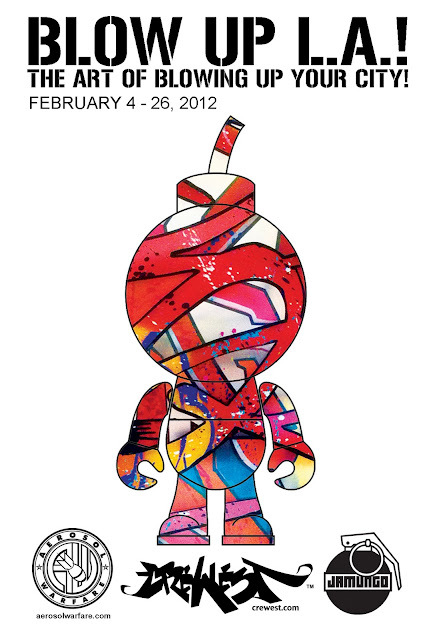 The stylized urban toys dolls and other artwork will be on display and for sale at Crewest Gallery from Feb 4, 2012 through Feb. 26, 2012. Exhibiting Artists: ASHIRA SEIGEL, BEAU POPE, BEZERK ONE, CAT CULT, CEASE ONE, ERIC MARTINEZ, FLIP ONE, GOOD HAPPENS, PRIMO, JESTER, PILOTFX, W3R3ONE, ROMEWON, DJ BATTLEMONKEY, REVEREND BUTTER, ABELS, CBELUM, SKEEZ181, DECKWGF, VALERIE G, JUSTIN GARCIA, TEXASCRAZE GWS, KAADI, KELYNE REIS, KWEEN ONE, NICKY DAVIS, PHYLO TSF, PYRO, SABRIAN CLARK, THIRD ONE TSF, TOK1, T KLENOW, VOTE RIGHT and more…. Month long event info is as follows: Opening reception will take place on Saturday, February 4, 2012 from 6-10pm at Crewest Gallery with live music by DJ Phyz Ed. 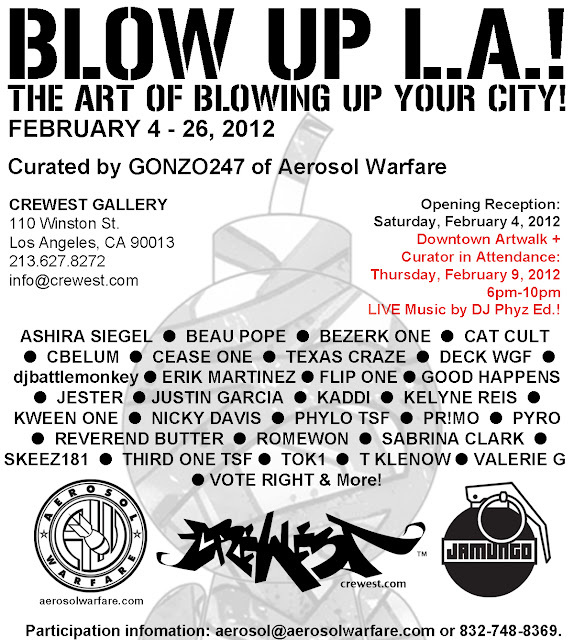 Curator, Gonzo247 of Aerosol Warfare will be present on Thursday, February 9, 2012 from 6-10pm during the Downtown Artwalk. Downtown Artwalk event will include live music by DJ Phyz Ed. Exhibit closes on February 26, 2012. Crewest is located at 110 Winston St., Los Angeles, CA 90013.